March sales were disappointingly low for Auckland's largest real estate agency but prices held up reasonably well. 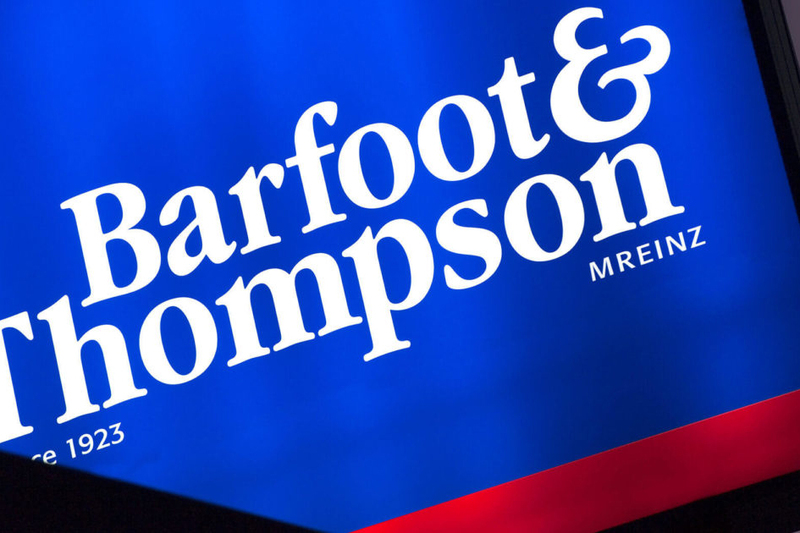 Barfoot & Thompson sold 963 residential properties in March, down 9.5% compared to March last year. It was both the lowest number of sales the agency has made in a March month since 2010, and the first time it has sold less than a thousand properties in March since 2010. However in spite of the lower sales volumes, prices held up reasonably well. Barfoot's average selling price was $931,673 in March, up $13,177 (+1.4%) compared to February and almost unchanged from March last year. The median selling price was $836,000 in March, up by $35,000 (+4.4%) compared to February, but down 2.8% compared to March last year. New listings were also down in March compared to where they usually are for the time of year, and that probably helped keep total inventory under control in the face of lower sales. Barfoot received 1571 new listings in March, barely changed from the 1563 it received in February, but down 7% compared to March last year. It was the lowest number of new listings the agency has received in the month of March since 2013. That gave the agency total stock of 4865 properties available for sale at the end of March, up 4.4% compared to February, but almost unchanged from the 4814 it had on hand at the end of March last year. However it was the highest stock level the agency has had on its books in the month of March since 2011, but only by a whisker. "Sales for the month at 963 were a healthy increase over the 474 for February, but were still not over the 1000 mark, which is where we have come to expect sales for this month based on the past few years," Barfoot & Thompson managing director Peter Thompson said. "However, this number is a vast improvement on those for January and February, which were among the lowest we have recorded at the start of a year in the past decade. But prices were remaining within a tight band and showed no inclination to decline or increase, he said. "It is a market requiring vendors to have realistic expectations if they want to avoid having their property on the market for longer than average, or eventually accepting an offer lower than an earlier one they declined," he said. A third of all homes the agency sold in March went for more than $1 million, and 4% sold for more than $2 million. Eight per cent of sales were for properties that sold for less than $500,000. The 'average price growth % year on year' chart will be drawn here. The ' average price' chart will be drawn here. The ' number sold' chart will be drawn here. The ' new listings' chart will be drawn here. The 'Auckland market share' chart will be drawn here. "Eight per cent of sales were for properties that sold for less than $500,000." Thats amazing, given in June 2016 houses under $500,000 made up 1% of total stock on Auckland market. Need to figure out exactly what "properties" includes. Small sections in the a** end of nowhere, and anything with leasehold titles (mainly leasehold apartments in the City and St Johns area) would be my first guess. I love the continual euphemistic references to the "level of choice"
Vendors won’t sell for cheap unless they are forced to. With employment high and interest rates low, not many will be under pressure to exit and settle for less. Well firstly, if they are not selling but the price is down if they do sell - then the market value of their property is still down. Secondly, a lot of people invested in properties at prices where the rentals didn't cover the mortgages but where they expected capital gains. So that means that they are parting with cash each week with the risk of further declines, so there is a good chance they will bail. Thirdly, when people come to refinance they will find their equity may be reduced and the bank. The critical component is a lot of stock still coming to market, and people sitting back and not buying promotes further declines - which creates a cycle of decline. In the same way prices are above fundamentals - they could fall below fundamentals. BLSH, as the "FONGO" increases, vendors own mindset will force them into selling. How do you think we arrived at these ridiculous valuations to begin with? HEIGHTENED EMOTIONS! While vendors have equity to realize, the absence of the cashed up marginal buyer says the slide is going to continue unabated. Speaking of “heightened emotions”, how are your term deposits faring these days? If/when interest become negative, I assume they’ll remain your favoured investment?? Agent TTP, if/when interest becomes negative, it will mean deflation has arrived. Bad time to be leveraged on property, fantastic time to be cashed up. You write, "..... if/when interest [rates] becomes negative, it will mean deflation has arrived." House prices would soon spiral upward if buyers earned a return (i.e. negative interest) in return for borrowing money to buy a house - i.e. negative interest would quickly ignite house price inflation. Buyers/borrowers might well choose to use the return earned to repay the loan principal. Certainly, if a bank offered me a loan at a negative interest rate, I'd be in with a grin to buy my much-vaunted villa in Ponsonby. But so would everyone else! Hence, house prices would sky rocket. But, alas, those who funded house loans via their term deposits would be worse off on all counts. Effectively, they would be paying the bank to hold their money (due to the negative interest rate)....... Thus, term deposit holdings would deflate in value. Agent TTP, to put it in highly technical terms - you're dreaming. In such times, banks would scrutinise your occupation as an insecure income stream. It would be much harder for you and many others to secure a loan for the "much-vaunted" Ponsonby villa. If what you say had some substance, the 80% of domestic depositors that fund NZ banks today would be diving into houses right now because they're (according to you) exposed to"paltry" returns - lol! Good grief Agent TTP, In times of deflation, the only thing that would spiral upwards is the value of debt! Not the houses that act as security for it. The underlying rationale upon which particular countries have adopted/sanctioned negative interest rates has traditionally been to stimulate (market-investment) activity - in order to promote economic growth. Historically, the strategy has been shown to work well enough. You can go and read the evidence. If negative interest rate loans/mortgages were made available to NZers seeking to purchase houses, there would be a huge boost in the demand for houses......... And given the chronic shortage of accommodation through much of New Zealand, house prices could only go one way - upward! In other words, because housing is in relatively fixed supply (i.e. inelastic - at least in the short-term) a strong inflationary impulse would be generated in the housing market. Conversely, because term deposit holders would receive a negative return on investment, the value of their term deposits could only deflate. Mind you, because financial losses would be made on term deposits, presumably no income tax would be payable. That may serve as some consolation to people like you?? Agent TTP, WOW! now your talking negative mortgage rates! That said, why would anyone (including me) put money in a bank. It's cheaper to dig a hole. No need for banks. Economic collapse? Time to start thinking and stop thinking like an Agent. Has there ever been a country that has provided a negative mortgage rate? Denmark’s gone negative but are still offering 1.5% (positive) mortgage rates. The other issue will be how long potential FHBs will be able to lock in record low rates for. It's one thing to be able to afford the payments on a mega-debt in the short term on record low rates, but another to be assured that record low rates are here to stay. There's still a bucketload of debt to pay down in the end. Given comparable house price valuations in Auckland with those of say Zurich, have Auckland residential real estate prices already priced in much lower mortgage rates? You do realise that "negative interest rates" doesnt mean you get paid to take out a mortgage? There is still this little thing called the bank net interest margin. That is exactly the way he thinks. K.W, exactly. Agent TTP's counter arguments are becoming more illogical by the hour - lol! If the RBNZ is required to undertake QE, then that will mean the economic environment is likely to be in a economic recession and there is a risk of deflation. Historical experience in the US, Europe, & Japan has shown what needs to happen for there to be a risk of deflation. RP - Sounds like your still looking/hoping for your Armageddon ! I think given the instability that our Government has caused whether it be CGT proposals ( that are ridiculous in their current form ), or exceptionally low business confidence, forced Min wage increase, ban on Oil&Gas exploration ( with no consultation or plan ) attacking Landlords on all fronts, KB flop, it's amazing the real estate market has been so robust. On top of that Brexit/Trump madness there is plenty to be concerned about. Even I commented ( you will troll the comment I guess ) that at a guess we could be in for a 7-12% drop, which may come to pass but not yet. Great gains in Wellington/Kapiti still being made thx. Given all the negatives, now that our RB has indicated OCR direction I would say that more TD money will be looking for a home with a reasonable return 5-6% still achieveable in many places outside of AK as the Man reminds us. A drop in prices is not unexpected to seasoned investors on the back of 90% gains over the last cycle, similarly to price corrections in 2008/9, 1998/9 , 1988/90. A correction we will/are having an Armageddon not. Of course in a couple of years time history will provide us with the outcome. I would say the 'slide is going to continue unabated' with TD's returns, which is unfortunate as it is not an incentive to save. So explain Sydney? Perhaps the Aus economy is slightly weaker than NZ, but not much. And unemployment is fairly low. Sydney shows significant price drops are possible even with lowish unemployment. Sydney/Melbourne have been caught out by a withdrawal of the cashed up Chinese buyer. Auckland is a year in the following. Both property markets left dangling on a thread of lofty valuations minus yesterday's exuberant buyer. Central Banks at the rescue with Interest rates near multi century lows. Bank lending criteria now noticeably tightened on both sides of the Tasman. Denial of these serious correlations is the doorway to financial miss-fortune. Melbourne and Sydney both have both built up large surpluses of accommodation, relative to their populations...... That's the opposite situation from New Zealand - where there's a chronic shortage of accommodation through much of the country. That's why the current NZ government launched (albeit unsuccessfully!) the "KiwiBuild" programme...... But there's been no corresponding "KangarooBuild" programme in Australia - no need for it! So the issue is really a DEMOGRAPHIC one. It is supply of housing relative to population (= demand) that explains the differences between Sydney/Melbourne on one hand and the majority of NZ localities on the other. Talk about Auckland prices following Melbourne/Sydney prices down is idle banter: the market fundamentals are completely different (as has been well-documented by the most reputable analysts). Near the peak prices in Sydney, there was an unprecedented housing shortage (underlying demand vs underlying supply) as estimated by economists. At March 2016, there was going to be an estimated housing shortfall of 114,428 residential dwellings at June 2018. "NSW could close its borders tomorrow and it would still take three years, at current construction rates, to build enough homes to fill the state's unprecedented housing shortage. The state's housing shortage will top 100,000 homes next year for the first time. Despite a boom in apartment building in some pockets of Sydney, demand for new homes is outstripping supply, a new analysis by ANZ Bank has revealed. Amid fears of a housing price bubble, ANZ senior economist, David Cannington, said the analysis suggested any price falls would be limited." "What this analysis says is there is still a lot of unsatisfied demand for housing. So even when prices do start to fall, that creates opportunities for potential households who are priced out of the market." "This is part of the reason why house prices are able to be supported at the high level that they are at the moment." NSW's resurgent economic fortunes are adding to demand for housing, helping to attract more migrants and stem the outflow of interstate migration. "Even with some of that strong growth in new housing construction, population growth is still quite strong and steady," Mr Cannington said. "NSW generally tends to have a negative net interstate migration, with people coming into NSW or Sydney and then migrating elsewhere. But that outflow has actually been a lot weaker. The ANZ analysis shows NSW is on course to build 56,000 new homes this financial year, after demolitions are taken into account. This is more than double the number of new homes added six years ago. But underlying demand for new homes is also expected to grow, by 63,000 new homes, leaving an annual shortfall of 7,000. This will add to the existing housing shortage, bringing it up to 99,137 homes this financial year, 106,424 next financial year and 114,428 the year after that." There's no chronic shortage of properties in NZ - there are more properties currently for sale in New Zealand than there are in Sydney, and Sydney has a bigger population. A few years ago people were talking about the "shortage" of properties in Sydney and Melbourne, due to the massive influx of immigrants. Now it turns out that none of those immigrants are buying houses, probably because they dont have deposits, and dont qualify for a mortgage, and they can't get any money out of China anymore. There might be a shortage of rental accommodation, that is driving rents up and forcing people to share rooms etc. But that isnt going to stop the prices of houses for sale from going down. FYI, Melbourne also has an underlying housing shortfall as per urban planners. "Victoria is underprepared for its booming population and needs to embrace higher density living if it is to keep up with demand for new homes, the Urban Development Institute of Australia (UDIA) has said. New data from the UDIA found that despite record-high levels of housing development, the state had a shortfall of 9,000 new properties in the past two years. It said if that trend continued it would lead to an undersupply in excess of 50,000 houses by 2020." Agent TTP, your response to these FACTS and EVIDENCE???? Clearly, the experts in Australasia also think they have had a significant shortfall of housing, yet prices are falling. The situation is very similar to NZ. CN, another excellent post :) Sydney, Melbourne - Auckland, as soon as the selling starts, it ushers in a glut of upper escalon priced homes. As prices continue falling, the basket will eventually refill will more affordable homes. Problem solved? Demographics and housing fundamentals are related to UNDERLYING demand and UNDERLYING supply calculations. Do you know about EFFECTIVE demand and EFFECTIVE supply? Australia currently has high employment, low interest rates, yet vendors are selling at a considerable discount. Your argument doesn't hold water. Sellers may hold on if they believe they can get a better price within the time frame they need to sell. But if they no longer believe prices will appreciate in the short term they will sell at a discount to avoid taking a bigger loss in the future. Not surprising that house prices have held up “reasonably well”. If it looks like a turd and smells like a turd it probably is a turd. Only a fool or someone with excessive pride would insist on a tasting session. ... on ever decreasing sales volumes with ever increasing stock. There is a name for what we're seeing in these prices - "Survivorship Bias"
It will bounce back.. just sit tight and don't pull that Ejection lever. Chairman Moa, yep, wait until there are only cashed-up buyers in the market are looking for a bargain, and sell to them for 30-40% below current values. Where are all the DGM crying "Wolf, wolf, wolf!!!"? At the moment trends look no more like a little puppy dog. Unlike other markets house prices are very sticky and often don't fall that fast. Looks like status quo for sometime especially with record low interest rates. Is that a quote from an economist circa 2017 on the Sydney property market? eidikós, prices in Sydney have been falling at about 1% per month, and the panic hasn't even set in yet. It's not like a stock market plunge, but that's pretty quick if you decide to sell. So looking at the stats, on a 3 month rolling average, Barfoots now have 7 months of available stock for sale or to clear or discount or give it away.Thankfully its getting close to Spring. Any prospective seller should advise Barefoots that the commission rates need to be substantially modified. Bayleys commission rates are probably the highest in the country and much higher than Barfoot. People list with bayleys, you pay for quality. Not saying barfoots is not quality. It never ceases to amaze me how just the hint of something can change the trajectory of a market . As discussed above, house prices in NZ are notoriously “sticky down”. In the vast majority of circumstances, people will only sell when there’s a profit to be made. Agent TTP, Auckland house prices ARE falling. Vendors will keep gathering at the exits where there is realizable equity/profit to be had and there is real fear the opportunity to do so is closing. It is going to spread to other centres as conditions further deteriorate. As an Agent you should seriously consider adapting to change. There are no sizeable falls in house prices in Auckland or anywhere else in NZ. In fact, some localities - such as Palmerston North and Dunedin - continue to witness very marked house price increases. Specifically, Gregg Ninness writes this morning: "Barfoot's average selling price was $931,673 in March, up $13,177 (+1.4%) compared to February and almost unchanged from March last year." As much as you have a reputation here for being a "Crash Crusader", your thoughts/comments about house price falls are noted as being largely illusory. Blurring the facts with your own particular biases & agendas is unhelpful to everyone. Agent TTP, "Auckland (median) down 2.8% compared to March last year" Headline from yesterday's article "Average property values are continuing to decline in Auckland" QV. It seems it's yourself who has an agenda to bury the truth. Shoreman, I respect your right to share common opinions with Agent TTP no matter how misaligned they are. CGT will be online shortly.. Any incentives to buy investment properties for a quick buck will be somewhere between zilt and 0. Unless of course you are TM2 who will be in positive gearing territory and buying below "market value"
Today's Barfoot auction results support your forecast - Shortland Street morning auctions for the Bays area saw 12 lots offered with one sold prior, and zero sold under the hammer. So not including prior sales of 1 = 0% success. Chairman, it is great to see that you have been reading and taking in what “The Man” has been consistently saying! I don’t need to make any comments in regards to property, as it has no benefits for us! However it gets extremely tedious to always be reading comments from the same posters who really have no idea on how to make money from property investing! There are always opportunities in every real estate market, and now is no different. People that make the real money in any market are the ones who take action and if they are not knowledgeable, then get advice from investors who know what they are doing. You need to take the word of wisdom from the Chairman more seriously. Property investment is a zero sum game and once you are on positive side, there is no guarantee that you will stay on positive forever. what is a per SQM cost of built at the moment? Surely it is very relevant to know what it will cost you to build a new house (economy, average and high spec) if talking about value of property? I think that value of land is significantly overstated, and therefore it can drop quite a bit, but with cost of material and labour ever increasing (with inflation rates significantly more than the rest of the economy) there is a bottom "value" for the existing houses. Thats not how it works. The cost of a new build historically was always more than buying an existing house.In a downtrodden market, no spec builds are happening,there is no bottom until bedrock appears. Labour and materials will go down in price. As work falls off and competition increases.. pretty standard and it aint the first time. Of course, the media here ensures that the fact that Auckland's median down 7% from its peak is completely ignored in their reporting. Melbourne was down 7% off its peak just a mere few months ago and the media in Aussie was very vocal about it. And now that has grown to nearly 11%. Certainly, Aussie's decline is happening a lot quicker than here, with Melbourne reaching its peak in Nov 17 compared to ours happening in Mar 17. But really it's pretty hard to see how that won't be Auckland soon enough. Is this their monthtly report? Why are they releasing this ‘incomplete’ set of data compared to the monthly extensive report with Auckland separately - is Auckland looking soooo bad??? Nothing on their website either. Are we still expecting a report tomorrow or the day after???? They released it with all the normal data (extensive) and commentary. Nothing abnormal at all. And it is here. Median price. March 2017 = 900K. March 2018 = 860K. March 2019 = 836K. No doubt about the trend. FYI, some property market commentators and participants look at price trends over a very different time horizon - this guy is looking at the property price trend in Auckland since the early 1980's (so about 37-39 years) and come to an entirely different conclusion about Auckland residential property prices in the long term.